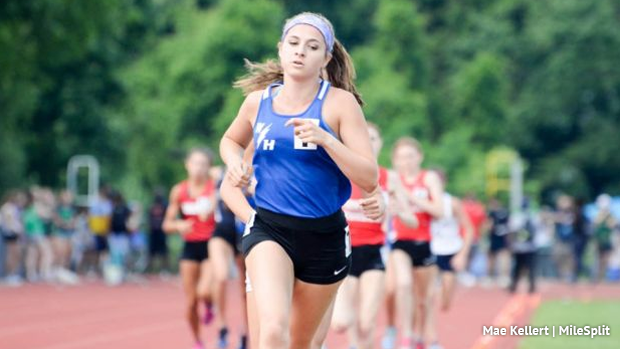 Warren Hills distance star Alexa Westley enters her senior spring season as the NJ#1 returner in the 3200m at 10:30.06. 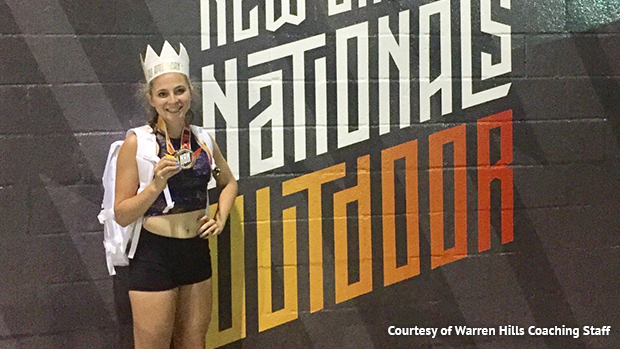 She is the two-time defending champion for the 3200m at the Meet of Champions, achieved All-American status at New Balance Nationals Outdoor in the 5K finishing third with a 17:03.95, and has three top six finishes at the XC Meet of Champions. She's committed to continue her education and compete at the University of Wisconsin next year. This past winter she ran her first ever indoor two mile race at New Balance Nationals Indoor right off a basketball season and posted a 10:58.92, NJ#10 on the season. 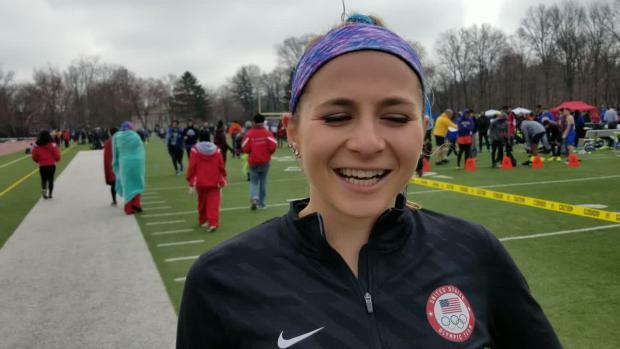 She returns to the track this spring with some big goals and state record pace in mind. Welcome back to the track! Coming off your final high school basketball season, how did it go for your team and for you individually? Saw your squad had a solid record and local championships. A: My final season of high school basketball was definitely an emotional, yet amazing part of my life. Our 2018-19 team officially is the best team in school history and finished with a school record of 24-4. The first 16 games we were undefeated and were ranked as the 15th best team in the state. Our team won our Christmas tournament, won the Skyland Conference Valley Division and we were undefeated in that as well, and we won the Hunterdon/Warren/Sussex county tournament for the first time since 1997. We made it back to the North 2 Group 3 state sectional finals for the second year in a row and sadly fell short in the finals, making that my last basketball game ever. It was a really emotional time because I have been playing since grade school and I'm leaving behind such an amazing team of incredible teammates and memories I'll cherish forever. In addition, I was fortunate enough to play my entire basketball career since the age of 9 with my best friend Nicole, which has been pretty awesome! Individually, this basketball season I was selected for the H/W/S county all-tournament team and awarded a Skyland Conference Honorable Mention for the second year in a row. Although my basketball career came to an end, I'm so happy I had the opportunity to play my senior year with a team that accomplished great things together! We've touched upon the choice to play basketball during the winter instead of run track in past interviews, obviously that works very well for you and you get to continue to do the things you love. 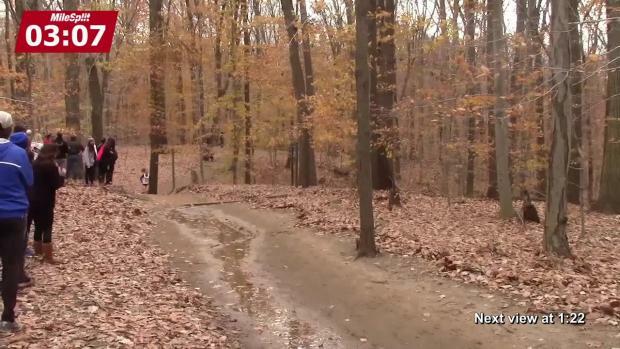 What are some of the benefits you see from having time away from the track during the winter season? A: I 100% believe that a large portion of my success on the track, comes from the amount of time I take off from the track. Going from my cross country training, which was super intense and put a lot on my body physically and mentally, was so refreshing and stress relieving to get a three month break from my training and to focus on basketball. I really worked hard on my quick movements, like side to side and short bursts of energy, my endurance was always challenged throughout the season which really showed on the court because my coach would keep me in for most, if not all of the game. In the 'offseason', I trained other muscles and got stronger, so once track season hit, I only had to get my endurance even stronger than it was before. Mentally, the shift from individual to a team sport was nice. Basketball took the pressure of being all on my own in running, to balancing the game between a team. Playing with close friends as teammates since 5th grade for Warren Hills and NJ Blaze my AAU team created a special bond on and off the court. My basketball team is super supportive of my running career, the school and the team even surprised me with a ceremony before a home game where they unveiled an All-American banner for me; since I was the first person in Warren Hills history to achieve this honor. And a second question from that, what are the types of exercises or training regimens that you add to your basketball training with success on the track in mind? A: As I mentioned before, I worked on side to side, and shorter distance exercises. My basketball coach and school trainer worked together to come up with what I could do during practice that would benefit both my basketball and track careers. For example, when we shoot foul shots,in between our partner and I running, my teammates would run along the border of the court, but instead I would run a full ladder inside the court to focus on sprinting and cutting. Also, coaches would push me by making me dribble a ball on a sprint while everyone else runs without a ball, and my goal was to finish before them even with a ball in hand. Obviously you're doing something right, you even snuck in a 10:58.92 in the two mile at New Balance Nationals Indoor. That ranked you NJ#10 on the season coming off a winter of basketball. I know you ran the mile last year at this meet, was this the plan for a while and how much full running focused training did you have before it? Did you expect the time you were able to perform? A: To be completely honest, I ran and performed a lot better than I expected. I knew and could feel that I was still in track shape, but my goal was to run around 11:00-11:15 and I would be happy. Of course, hearing that time goal from my coaches made me hungry to try my best to get under that. In my heat, which was second of three, I didn't really have a set game plan since I've never run an indoor two mile. 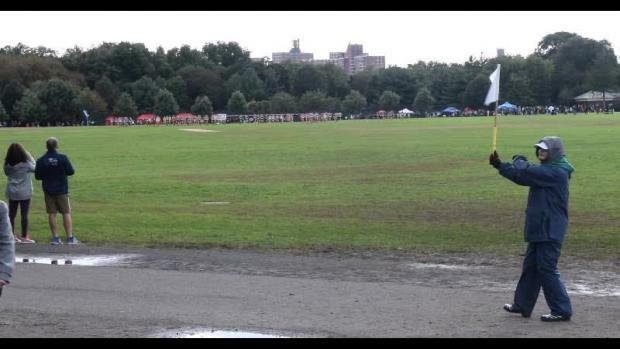 It was more like, "Lexi you're a veteran runner, go out and use your track instinct and run the race as it goes." As the race spread out, I pushed to stay with the top pack, and mentally was all in. I kept thinking that if all these girls have been training for weeks and I haven't, this is a good sign that I am keeping up. My legs and body felt really good during the race and it was so nice to be back tearing up the track. During basketball season I mostly focused on my basketball skills. I would still go to the gym and lift on my own time, but I would run on the weekends, or in between days when we didn't have basketball games. If basketball practice fell on a 5-7pm day, I would run at the track for a few miles before basketball. I was cautious not running too much especially when we had three basketball games in week. It felt so amazing to see a 10:58 full two mile on the clock. My coaches and I were both extremely proud and it showed I was ahead of where I was last season, putting me in a great place for the season ahead. 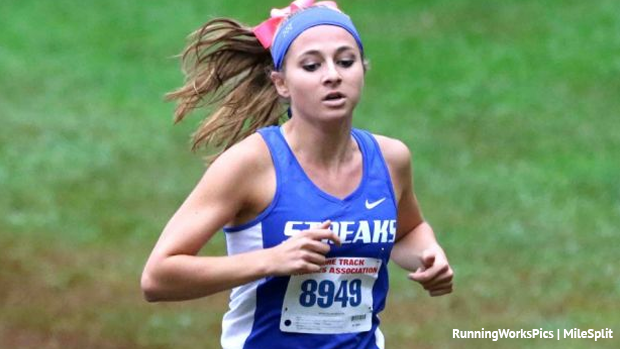 Coming into your final high school track season you are a two-time defending 3200m Meet of Champions winner, were third at New Balance Nationals Outdoor in the 5K last spring, and had another very strong cross country season this past fall. We know a third title at MOCs has to be in there, you'd be just the fifth to win at least three two mile / 3200m titles, what are some of your goals to close out your high school career? What is your biggest motivation entering this season? A: I look back at my high school career and I am so thankful to the people who have helped shaped me into the runner I am. I have set such high goals for myself and my coaches and family always believed that I could achieve those goals. I want to be the best I possibly can, and my hard working attitude keeps me pushing to get better and stronger each week. After my freshman season, my goal was to set a new state record in the 3200m. 10:12. It has been on my mind for the past three years and I want to be the top female distance runner in the state, and set that new record. In addition, I want to lower my PR to 4:55 in the 1600m. I've worked a lot on my foot speed and I know I am strong enough, I just need to execute it. These goals and my huge support system are what truly motivate me. I am so grateful to have such an amazing support system in my life. My parents, grandma, brother, aunts, and uncles, and closest friends all come to as many races as they can. They traveled to NXR, and many came all the way out to NXN in Oregon, always cheering me on with their "Run Lexi Run" signs. In addition to my family I'm so thankful to have such a close bond with the guys on my team. They push me in practice, consistently motivating me and always cheering for me in meets along the sidelines. Their such amazing teammates! Thanks Billy, John, Mike, Will, Gavin, Aidan, Eddie, and my girls Erin and Joy. My coaches, Coach Kurpat and Coach Carroll push me to be the best I can be and inspire me daily to strive for my goals. Jeff, thank you for pushing me to be physically and mentally strong, always believing in me. I am so excited and motivated for my final high school running season to begin and get into full swing. Are there any big races / invitationals you have scheduled during the regular season that we should keep an eye out for? A: To be honest, I haven't decided what big races and invites I want to run this year. My coaches and I have a few different meets we're looking into, our decisions will depend on how I'm running during the season. As I progress and when were comfortable with my times, my coaches and I will make some decisions. With a season still to go, what a journey it has been: soccer player turned track star, and still able to enjoy success on the court as well, multiple Meet of Champions victories and top finishes, amazing times on the cross country course and around the track oval, All-American at Nationals, one of the top runners in the country, and heading to the University of Wisconsin next fall. For the up and coming talent who may be reading this and looking up at the successes you have earned so far, what are some words of advice you can give to those athletes? A: My biggest goal is to inspire young athletes and girls to achieve whatever they set their minds to. I can still remember stepping onto the track at my first sectional and group state meet. 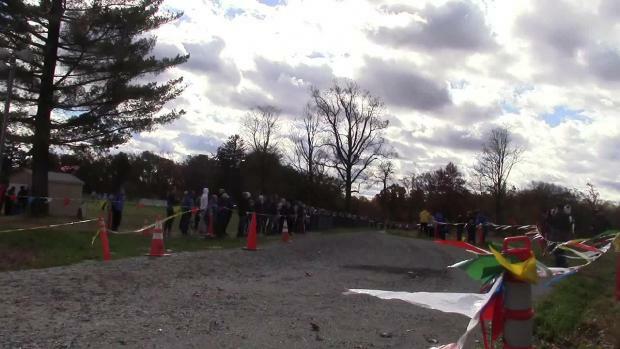 I looked down the line, and saw times on MileSplit and would admire the girls ahead of me. I wanted nothing more than to get better and one day be just as good, if not better. My piece of advice, set your goals high and always work hard; don't cut corners on workouts and listen to your coaches, they want what is best for you. Track is such a unique sport and I've put everything into it, eating, sleeping, and hydrating right; it all helps and makes a difference. No goal is unreachable, each day at practice push yourself outside your comfort zone and strive to get better each race or workout. Listen to your body and recover when you need it. You'll be successful no doubt about it!